HETHERSETT HAWKS / YELLOW BRICK MORTGAGES opened their League campaign with two home defeats to Ipswich. In Division 1 the reigning champions, boosted by winter transfers, were far too strong for the Hawks. However, the below strength home side competed well in most races and gave a much better spirited performance in the second half. Highlight was Charlie Lyth’s win over the Brinkhoff brothers in heat 16 after David Adams had worked hard to create the opportunity. Leigh Cossey led the side well with two wins but it was a question of less experience and lack of match fitness that showed overall. The Division 2 match was much closer and the Hawks led for a long spell before a 7-2 reverse following an exclusion in heat 11 gave Ipswich the lead. Four shared heats followed leaving Ipswich two points up going into the last race but Lewis Brinkhoff and Fraser Harris sealed the match with a 7-3 win. Charlie Lyth and Ben Loombe led the Hawks attack well with sound teamwork from Glyn Morgan. McKenzie Loombe made his debut. The matches saw the launch of the Hawks’ new sponsorship deal with Yellow Brick Mortgages. 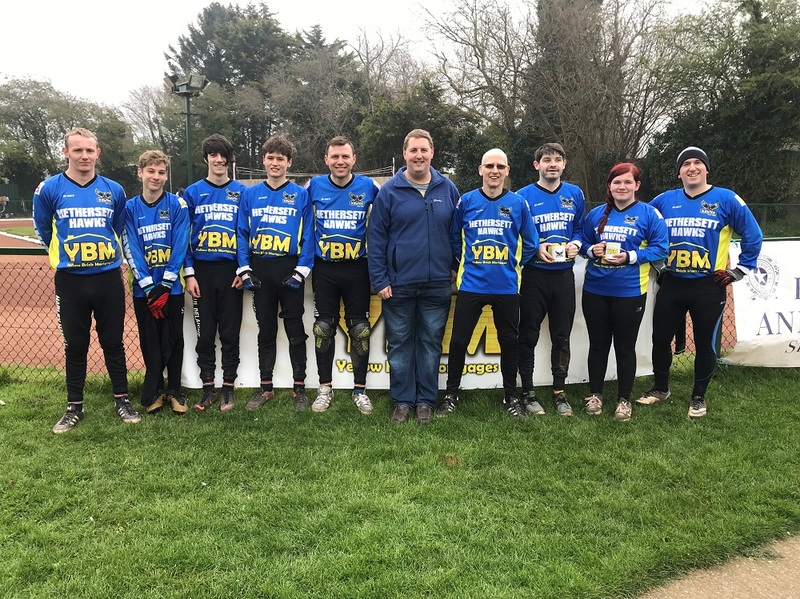 Managing Director Stephen Perkins is shown with the team at the Hethersett track. Charlie Lyth, Paul delaiche and Daniel Longlands finished 1-2-3 in the Junior final at the first round of the British Youth & Junior League at Ipswich. George Larter-Dixon won the B Final in the Under-12s.